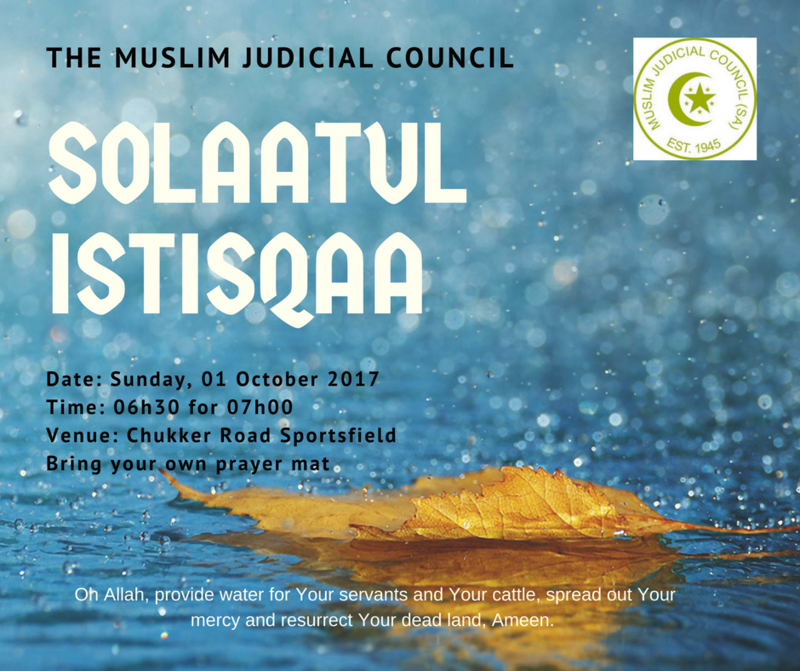 The Muslim Judicial Council (SA) calls on the Western Cape community to perform Solaatul Istisqaa in congregation on Sunday, 01st October 2017. It is also the Significant day of 10th Muharram 1439. May we use this day in begging of Almighty Allah to grant us relief, fill our dams and revive our dead land, Ameen. “There must be good intention and readiness and willingness to turn to Allah SWT and seek mercy and rahmah. While fasting is not a pre-condition for Salahtul Istisqaa to take place, there must be taubah and the acknowledgement of sin and transgression,” says MJC deputy president Maulana Abdul-Khaliq Allie. “We must continue to do this and exert ourselves in making good deeds, such as sadaqah and any other a’maan that will draw the mercy of Allah SWT. According to some Islamic scholars, while all sins have their consequences, there are certain social conditions that give rise to drought and famine. The environmental challenges facing communities today are meant to serve as a reminder of the spiritual and moral void in the contemporary world. The appointed imam will lead the congregation in the prayer, which consists of two raka’ahs. The timing for the Istisqa Salah is anytime ‘nafl’ optional prayers are permitted. Audible recitation will be conducted in both the rakaats. It is preferred to recite Surah Al-A’laa in the first rakaat, and Surah Al-Ghashiyah in the second. Thereafter the Imam will deliver a khutba. Following this, the imam will face the qiblah and make fervent dua. The imam will also flip his shawl (upper garment, cloak or sheet) – symbolically as a good omen or gesture) to signify the anticipated change from drought to prosperity. This article was first published by The Voice of the Cape on 10 March 2017.